Thomasina came into my life almost a decade ago. Her situation had been dire - neglectful home, shelter bird before that, who knows what had truly happened to her. She came to me a damaged and untrusting soul, who'd fling herself off perches and bloody up her wings if anyone even got near her cage. She resonated with me, and before too long we'd bonded completely. 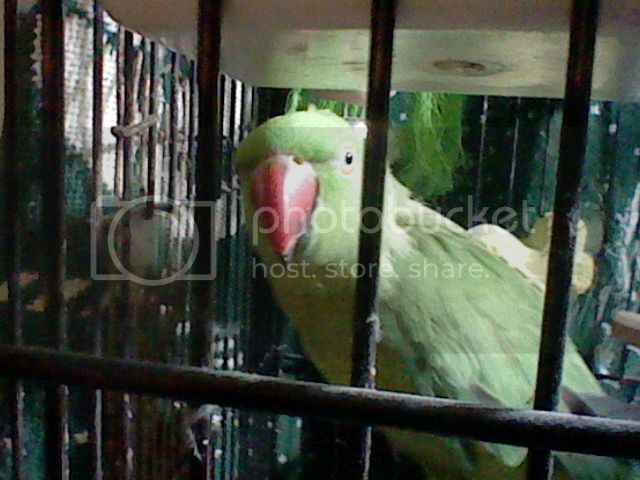 I've lived these past few years with the boisterous big green birdie girl that she became. She always cheered me up when I was sad and made me laugh with her silly antics. I've told stories about her here. She was my spoiled princess and she knew it. Today, the bane of my existence and the love of my life...is gone. And she took my heart with her. I don't know if what she died from was something that had been coming on for a while and I'd just not noticed until it was too late or if it was a sudden onset, but I know that once it truly hit today, she did not linger. I spent her remaining time with her, petting her, talking to her, and simply being near her cage as she slept. She was still my big girl until the end, making her usual "Hiiiiii!" noise and her happy sounds when I petted her. When she died, it was in my arms, cuddled right up to my chest, while I cried. As I write this, it's been several hours since, and I'm still crying. She's going to be buried in the backyard tomorrow, in a shoebox, under a small pine tree. Her moulted feathers and the few pictures I have of her I will keep. I don't know if the future will bring me another IRN, but she'll never be replaced. It's always so hard to lose the shining creatures we keep in our lives. Myself, I think it's worth it. I'm wishing you peace.